Think of something observable - countable - that you care about with only one outcome or another. Let's call this phenomenon . Let's also define a number, , as the total number of occurances of . So it is the total number of shots taken, the total count of people diagnosed, the total number of votes cast. Now remember, is something you care about. It is likely, since you care so much about , that you have some preference for one of the two possible outcomes. For the purposes of this example, let's say we prefer . is a shot made, a vote recieved, a survival. is a "success", from your perspective. And an outcome of is a failure. 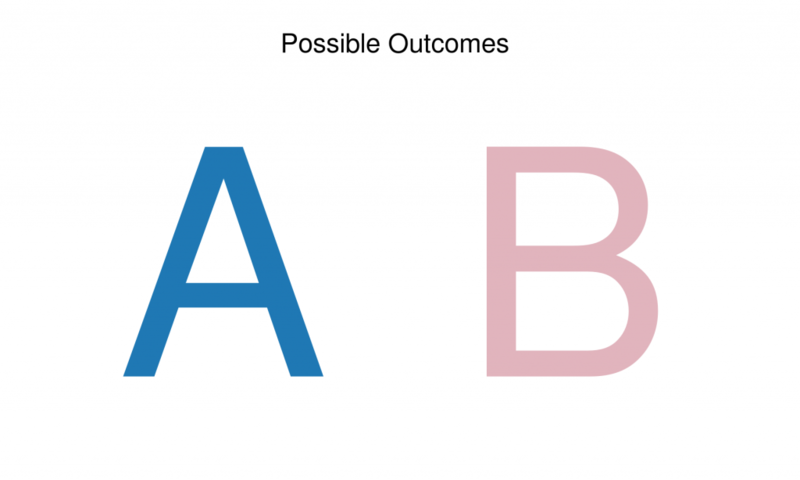 Lets define another value, given that we prefer outcomes over outcomes. is the number of outcomes out of all the times happens. It is the number of votes that your candidate is going to get in that election, the number of free throws the big man makes, the number of cancer patients who survive. Of course, we can define this kind of process in this way even if we don't actually prefer one outcome over the other. In the case of the gender of newborns, for instance: we can define as the birth of a girl and as the birth of a boy, and treat the birth of a boy as a failure, just for the purposes of our model and not because all little boys are born clinically insane. It would be nice, probably, to have an actual number as an estimate for , or perhaps a range of numbers you can be confident contains the value of . And perhaps you want to make some prediction about future occurances of . You want to know if someone you know with that particular form of cancer is likely to still be alive five years from now. Or maybe your friend, also a fan of that same basketball team, thinks that your guy actually only misses about half the time. Or a political talking head says that your candidate is going to lose big. You probably want a way to compare your beliefs with theirs. Essentially, we would like to estimate the unknown quantity , preferably with some additional estimate of our uncertainty of this value, use that estimate to predict future values of trials of , and, given that estimate, get an idea of who is more likely right about that quantity given disagreements. where is number of trials - the total number of cancer patients, shots taken, votes cast - is the number of successes or cases where the outcome equals A, and is that unknown value between 0 and 1 that equals the proportion . This distribution describes the probability that equals times in occurances (also called trials) of . And in fact this product simplifies to the formula for the binomial distribution above. It is important to realize that the value most useful for us to know the most about in the formulas above is not or or any single but . That function call generates a single pseudo-random number between 0 and 1 from a uniform distribution, meaning that the value is equally as likely to be anywhere in that (0,1) interval. I can't calculate from that understanding, at least not just by looking at it. It probably wouldn't be possible to count all the outcomes up there, given how jumbled they are, and even if it was, there's no way I can count them in any reasonable time. Maybe most of them haven't even happened yet, in which case I definitely can't count them. Actually, I don't even know what the total value of N is. But I can tell some things from that picture, right? For instance, I know that there are definitely at least some trials where the outcome of is . I know that there are at least some trials where the outcome of is . In this case, actually, outcomes look pretty rare and it seems a pretty safe bet to say even more than that: our boy misses most of his free throws, or our guy is going to lose this election. Since our random variable stores outcomes as successes or 1's and outcomes as failures or 0's, we can easily obtain our sample - by summing up all our occurances of . Which in this case turns out to be 26. We could just calculate the sample proportion of and take that for our estimate of . In this case, that would be 0.052. But that estimate only allows us to achieve part of one of our three goals above. We can't really compare our opinions to anyone elses with any meaning, and we can't use that number by itself to predict future values. But what if we treat our parameter as a random variable? What if we assign it a 'mean' or a most likely value, and a variance, or some quantification of uncertainty around that mean? In this case, the posterior probabilility is the conditional probability distribution we get for given the data and our prior distribution for . because we know that it, with respect to the conditional distribution of - - is just a constant. And since is a probability distribution, we know that it has to integrate to 1 in the end, so determining that normalizing constant after we have the non-normalized distribution shouldn't be a problem. 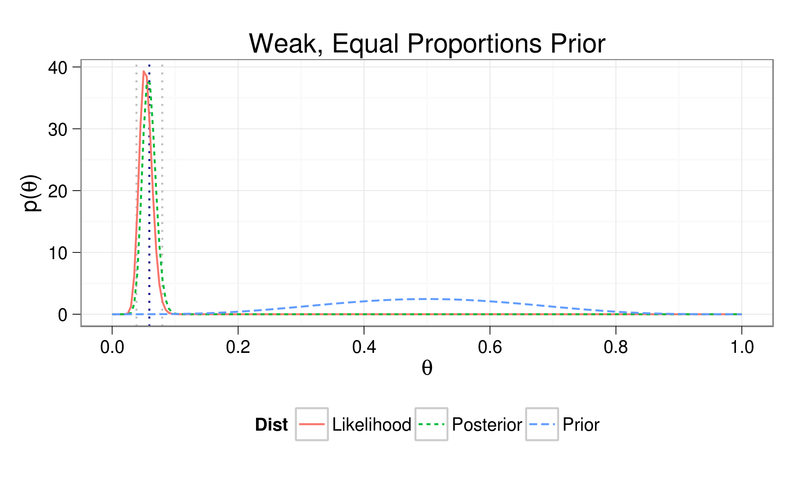 The posterior is proportional to the product of the prior and the likelihood. This is the central - really the only - tool of Bayesian statistical inference. And it suggests one of the central appeals, to me, of the approach: every input into a Bayesian framework is expressed as probability and every output of a Bayesian framework is expressed as probability. To use this generalization of Bayes' theorem to answer our above questions, we first need to come up with a model for 's distribution. There are a number of ways that could be distributed. In fact, any distribution that ensures that the value of will be between 0 and 1 will do. In this first example, we will take advantage of the fact that there exists aconjugateprior for the binomial distribution: the beta distribution. 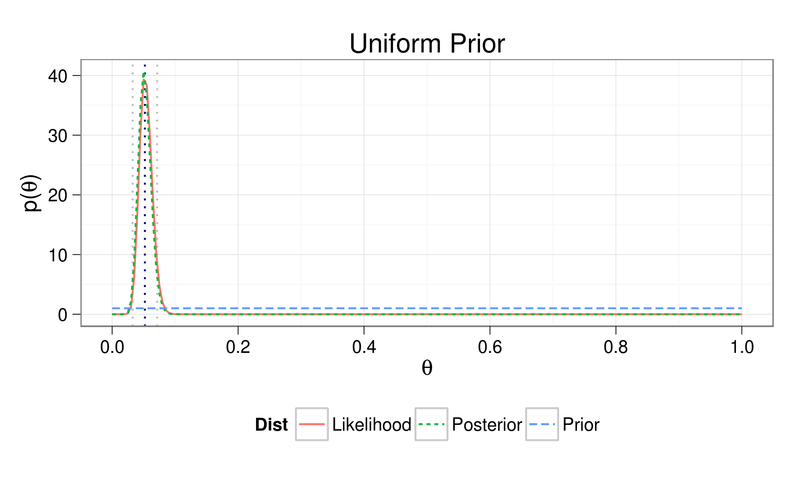 except it represents the probabilities assigned to values of in the domain given values for the parameters and , as opposed to the binomial distribution above, which represents the probability of values of given . This also is a beta probability distribution, with equal to and equal to . But how do we choose our beta priors? 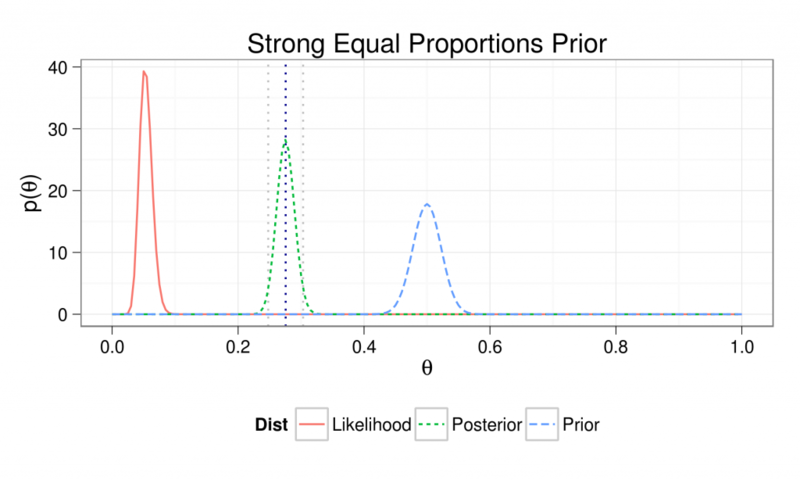 The shape of a beta distribution is dictated by the values of those and parameters and shifting those values can allow you to represent a wide range of different prior beliefs about the distribution of . Priors can be ``uninformative'' or ``informative'', meaning we can weight our prior probabilities very low in relationship to the data or we can weight them higher, informing our outcome - the posterior - more as we weight them more. 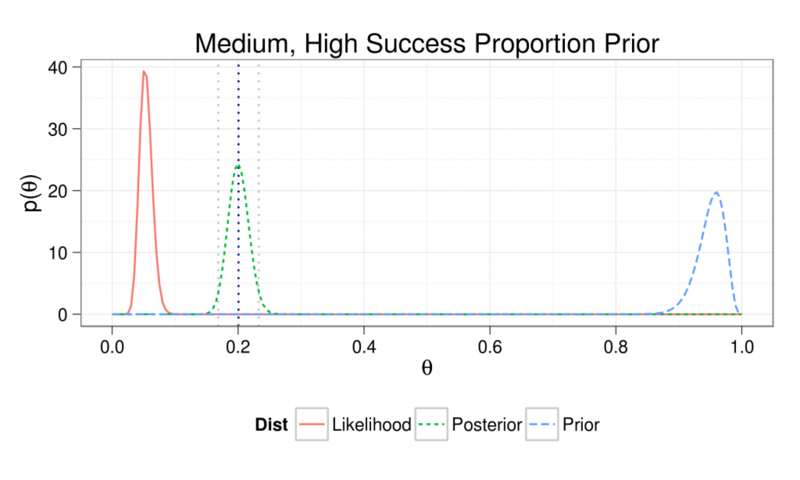 Essentially, higher values of the ratio of to weights higher values of higher, lower values of that ratio place greater weight on lower values, and higher value of indicates higher certainty. Still, choosing these 's and 's may seem a bit arbitrary. Perhaps a more intuitive way to choose an informative prior is to allow ourselves the ability to calculate analogous values to and - essentially a value that actually quantifies our prior belief about the likelihood of success and a value that quantifies how strongly we weigh that belief as a prior ``sample size''. We want to be able to express the 'mean' of our prior distribution - its most likely value - and something like a variance or how tightly clustered it is around that mean. where, again, expresses how large our prior ``sample size'' is - i.e. the higher it is, the stronger our beliefs - and expresses our actual prior belief for the value of . And expressing the likelihood - a binomial - as a beta where equals and equals is another simple function. can all be accomplished using functions of similar structure. where the dotted gray lines indicate the outer bounds of our credibility interval and the dotted blue line indicates our mean. The mean of our posterior distribution equals 0.052, the mode equals 0.05, and the standard deviation equals 0.01. This gives us a 95% (normal-approximation) credibility interval of 0.033 to 0.071. Our posterior and our likelihood distributions are almost identical, as would be expected, since our prior is essentially that we have no idea and the data should give us all of the information in our posterior. The mean of our posterior distribution equals 0.059, the mode equals 0.057, and the standard deviation equals 0.01. This gives us a 95% (normal-approximation) credibility interval of 0.039 to 0.08. Our mean and mode is a bit higher than before, as we weighted our prior beliefs a little bit, but our posterior is very close to our likelihood, meaning that most of the result was informed by the data. The mean of our posterior distribution equals 0.276, the mode equals 0.275, and the standard deviation equals 0.014. This gives us a 95% (normal-approximation) credibility interval of 0.248 to 0.303. The mean of our posterior distribution equals 0.201, the mode equals 0.2, and the standard deviation equals 0.016. This gives us a 95% (normal-approximation) credibility interval of 0.169 to 0.233. The mean of our posterior distribution equals 0.05, the mode equals 0.049, and the standard deviation equals 0.009. This gives us a 95% (normal-approximation) credibility interval of 0.033 to 0.068. So how did each of our models do, in this case? 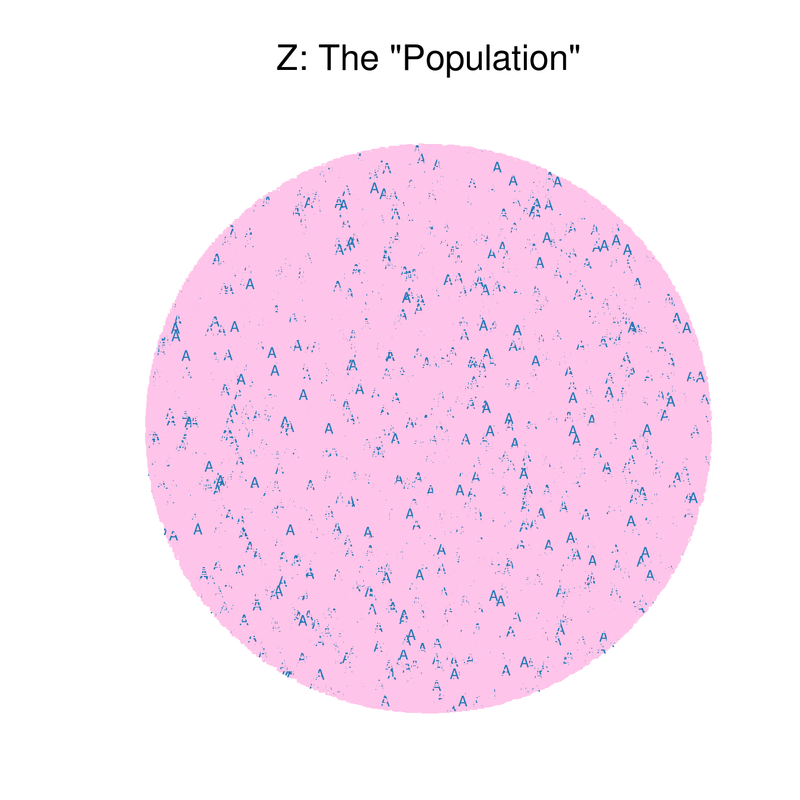 Well, since we simulated this data, we can discover that actually equals 0.042, or about 4% of all occurances of result in outcomes. 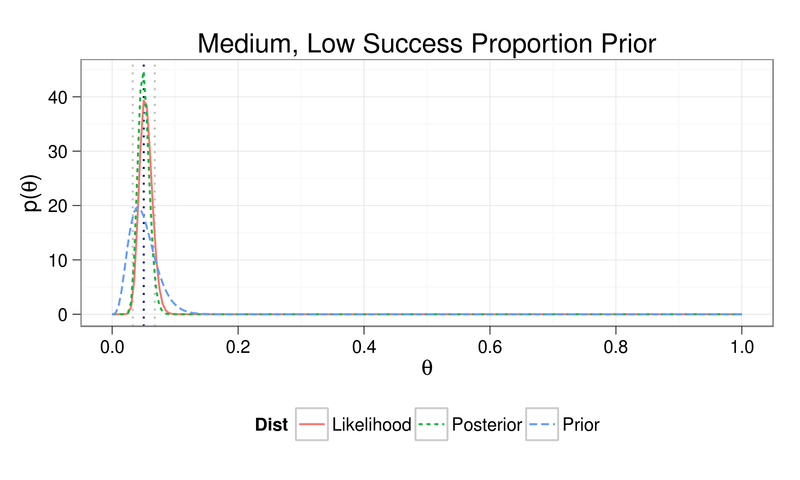 And it is obvious that our two initial priors - the non-informative uniform and the weakly informative equal proportions - and our last prior - the medium confidence of a low proportion of success outcomes - all gave fairly accurate estimates of . Our strong, equal proportions prior and medium, high sucess prior - what could be called, with a terminology nod to John Myles White, our "strong, wrong" priors - gave pretty bad estimates, obviously, though the likelihood moved our posterior much closer to the truth in the second case, and our updated belief is much better in both cases than where we started. And if I didn't know anything about or I had an idea but not a lot of confidence in it, why wouldn't I choose either of my first two priors, both of which arrived at perfectly serviceable estimates for ? It would be easy to establish that my analysis was based on those flawed assumptions. It could even be done by someone who has only a cursory understanding of how I actually arrived at those estimates. In future posts, I would like to continue this example and examine the effects of smaller sample sizes and the ease of updating beliefs using a series of smaller samples, much as Kruschke and Bolstadt do in their texts. I think their choices for visualizations and some of the explanations in Bolstadt are sometimes more confusing than necessary, and establishing a stronger single thread through the explanations would make things more intuitive, so I'm going to attempt to actually do that here. Krushke and Gelman have excellent explanations for all of this that are well worth the read. I would also like to look at comparing beliefs and predicting future values in binomial proportions as well. At his seminar on Bayesian methods back in April, John Myles White said something about traditional statisticians being better at actually getting things done over the course of the development of modern statistics. I didn't really understand what he meant until recently. The basic toolkit of Bayesian statistics produces intuitive, easier to understand - and use and update and compare - outputs through comparatively difficult computational and mathematical procedures. Everything in and out of a Bayesian analysis is probability and can be combined or broken apart according to the rules of probability. But understanding code and sampling algorithms - really understanding algorithms and computation generally - and a much deeper grasp of probability distribution theory are much more important in understanding Bayesian inference much earlier on. Basic traditional statistical methods produce output that is fairly difficult to understand through comparatively simple computational and mathematical procedures. Most results in traditional statistics depend on logical appeals to unseen - really un-see-able - asymptotic properties of the estimators being used and assumptions and relationships between samples and populations that may be valid or not in any given case. This is a very real catch-22: always easier to understand and use, much harder to do initially versus always harder to understand and use, much easier to do initially. I think that much of the difficulty so many have when faced with statistics comes from the fact that traditional OUTPUTS are so unintuitive and seem to exist in isolation or only in relationship to something with a touch of the `other' about it. The concept of maximum likelihood and the MLE methods that comprise the basis of much of traditional methods are very elegant - actually quite beautiful - logical constructs that manage to give one the ability to say SOMETHING when faced with the problem of lots of data and not a lot of computational power. But that's not our problem anymore. Now we have lots of data AND lots of computational power. Our problem now is statistical literacy, and building on the body of human knowledge in a way that is both rigorous and democratic. Hadley Wickam's ggplot2 - this R package is something of an obsession of mine. Learn it well and essentially any static visualization is available to you. Incredibly powerful tool. Scott Lynch's Introduction to Applied Bayesian Statistics and Estimation for Social Scientists - This book wasn't on my original list, but it has become my first stop. Especially if you think in code instead of equations, his explanations are fantastic and his walkthroughs of sampling algorithms and MCMC are great. It can be purchased here. and of course the Bolstadt, Kruschke and Gelman books and the work of John Myles White mentioned in my initial post here. 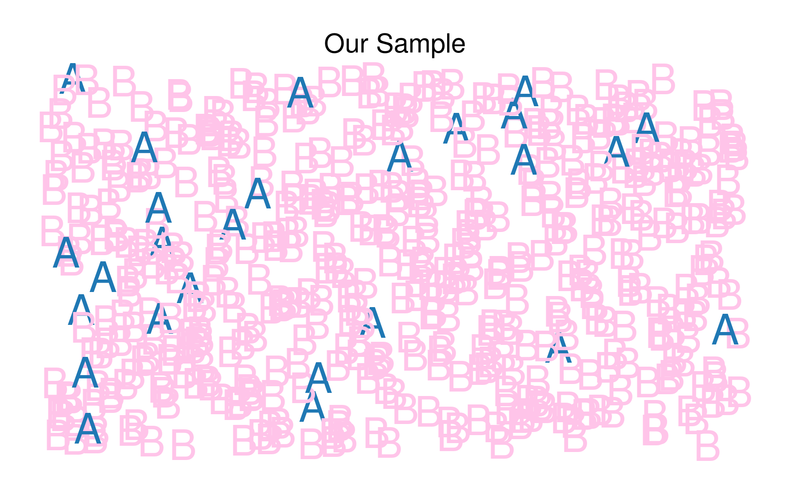 Amazing explanation, with pretty pictures *and* R-code. Thanks! Thanks for the very detailed illustration you have described in this page. I have tried to use your code and replicate the charts (I'm loading ggplot2), but without success. I have tested that ggplot2 is otherwise working well. It is. To avoid confusion, I have also copied all the different piece of your code into a single R script document and sourcing it. Your feedback / help would help tremendously. This is an excellent article! One minor suggestion: in a couple of spots, I was thrown off momentarily by the use of a single dash for a parenthetical, because it appeared between math symbols and could be mistaken for a minus. It might be clearer to use an em dash for those parentheticals—it looks less like a minus sign (see what I did there?). Thank you very much for the clear explanation and the R code. However I copied it, all run correctly, but I do not obtain the graphs.